My parents spent the weekend at my house recently, and besides the standard good feelings of spending time with the people who raised me, I’ve come to look forward to these visits because they are two able-bodied adults who can help watch my kids. Once the initial greetings are shared, bags unpacked, and meals cooked, their presence in the house offers the unusual chance to sneak away to check my email unmolested and go to the bathroom without being interrupted mid-stream by a door-pounding demand for apple juice. Since my kids won’t be old enough to read this for a few more years, by which time they’ll probably hate me for other reasons, I’ll say this out loud: I sometimes fantasize about a life without them. Okay, I fantasize about that all the time, but the daydream is most vivid at those times when I know the childless people in my peer group are off doing the spontaneous, self-indulgent things you can do when two little bellies and attention spans aren’t dependent on your constant presence. I think about it on Friday nights, when instead of going to a concert or movie I’m chasing my naked two-year-old daughter down the hall after a bath so I can slap a diaper on her before she pees on the carpet. I think about it on Saturday afternoons, when instead of flipping channels between baseball games and movie reruns, I’m at the park spotting my five-year-old son on the monkey bars to avoid another trip to the emergency room for a broken wrist. And I think about it a lot on Sunday mornings, when instead of sleeping in and enjoying a leisurely breakfast while reading the Sunday paper, I’m mopping up spilled bowls of cereal and juggling remotes to find the right episode of Dora on Netflix. No one was going to stop her. It was cute, see. I should mention now that she was wearing nothing but a diaper–she had stripped off her PJs earlier during an Alvin and the Chipmunks dance party in her brother’s room–and carrying a bag of Corn Chex. I tried to prop the iPad on the arm of the chair and continue reading, which worked for a minute until I started looking at the slideshow that accompanied the article. “Cow! I see cow!” she squealed when she saw a picture of a brown cow standing in a verdant Irish pasture overlooking the sea. “More cow pictures!” I tried to convince her that was the only cow picture in the series, but nothing else would do until I had pulled up a Google image search of every cow, bull, heifer, and steer you’d ever want to see. 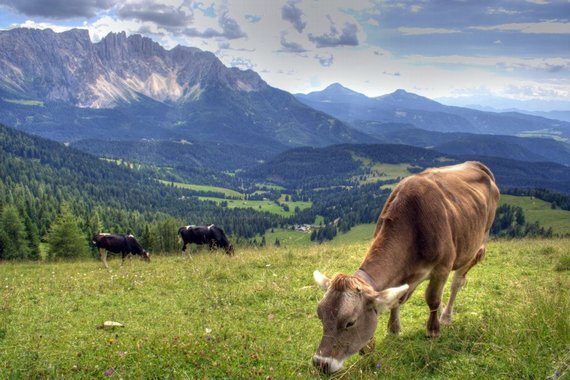 Soon we were watching YouTube videos of placid Swiss cattle with giant bells around their necks munching grass in the shadow of the Alps. Sunday morning fantasy: over. What bothers me more than these compromised moments of leisure is the feeling that my kids take up my time to write. In terms of hobbies, writing is a terrible choice, because it may be the only one that makes you feel guilty when you’re not doing it. I use my kids as my excuse, as in “I’d write at night after work, but by the time we’ve had dinner and get the kids to bed it’s 9:00 and I’m worn out,” or “I wish I could write on the weekends, but my wife works a lot and I’m always stuck with the kids.” It’s a convenient way to rationalize pure procrastination and the fear of, I don’t know, failure I guess. At least parenting is a more responsible excuse than saying I pissed away my time playing video games or nursing debilitating hangovers, but it’s an excuse nonetheless. I know this every time one of those whiny thoughts pops into my head, but it never stops the rush of jealously I feel when a friend from my writing group says she spent the afternoon at a coffee shop working on an essay, or when I hear about people my age with the independence to strike out on freelance writing careers. Never mind that given all the free time in the world, I’d develop much more subtle, insidious ways to explain away my lack of production. I still feel a sense of injustice that they seemingly have all these opportunities to write and I don’t. I’ve only been writing seriously for about eight years now, but I’ve already inherited the mantle of self-aggrandizing victimhood, that feeling of possessing a voice that must be heard but can’t because of the conspiring forces of short-sighted editors, unappreciative bosses, and family obligations. And since it involves my offspring, it’s countered with equal measures of guilt for feeling like I’m entitled to anything other than the satisfaction of raising two healthy, happy children. To her credit the dog was white with black spots, just like a Holstein cow, and half the size of one too. If we hadn’t spent a half hour that morning watching videos of cows, she wouldn’t have made the comparison. And if I had spent the morning scratching myself in a bathrobe instead, reading the news and watching Chris Berman bellow on ESPN, it would have passed unnoticed, indistinguishable from every other lazy Sunday morning. I might have looked past the picture of the cow, finished that article, and sat down at a computer to write something. But then if I spent my morning alone, what would I write about? Matt Wood is the blog editor for TriQuarterly Online. His work has appeared in Creative Nonfiction, The Best Creative Nonfiction, Vol. 3, Oprah.com, South Loop Review, Elysian Fields Quarterly, and many others. In 2010 he was nominated for a Pushcart Prize. You can find more of his work at Wood-Tang.com. Florence King was at heart a Randian libertarian, seeing identity politics as antithetical to her sacred sense of individualism and thus worthy of scorn. If life keeps "flowing, always flowing, smashing everything" as it rushes toward the ocean of death, the desire to scramble for the bank and sit the whole thing out on dry land is understandable. Substitute “dinosaur” for “cow” and “he” for “she” in the last paragraph of section 1 and you have my life exactly. I don’t ever write either. But I’ve long ago stopped feeling guilty about it. It’s just not where my life is right now. I’ve got a 21-month-old at home, and I can relate. Writing for me now is more like hit and run accidents. But I don’t have to drive to work, so I usually get an hour and a half each day to write during my commute if I want. And though it might take some will power, I will write at night after she’s asleep. I’ve occasionally gotten up super early to write. But I only have one. I don’t how it’d be with two. I think, as you allude to in the end, it does feed your writing. You get the experience of parenthood under your belt, and you have all those new emotions and situations to draw from. You might not get to draw from it until they’re teenagers though, when they want nothing to do with you. I’m not a mom and I’m not a writer so my credentials are nonexistent. But I would like to recommend Tillie Olsen who died a few years ago. She was a true red diaper baby–her parents were immigrant Jews who were socialist activists in Russia in the very early years before coming to America. Anyway, Olsen raised 4 children almost alone, always had menial drudge-work for jobs and managed only a few minutes here and there for writing. Her output was very lean. In the heady feminist days of the early 70s she was read a lot more than she is today. My point is not: you, too, can do it if you really want to, but: how terrifically hard it is. M ~ A wonderful essay–and one that rings so true. I’m on the other side of this experience you’re having, my three kids now grown and gone. I recall, still amazed, at composing a piece in the family room, t.v. going, dog pacing, kids whining, my wife on the sofa, and somehow writing something that worked, worked so well, in fact, that it was the first piece I ever published. I no longer have to imagine life without kids, nor wrestle with the guilt, as you point out, such day-dreaming affords. I did carry on all those years. And though my muse at times grew remote, no doubt miffed at my lack of constant attention, she stayed by my side and true to my desire. I am happy to report life on the other side is, indeed, all that I had dreamed it would be. It is of course cliche to say it goes fast and enjoy it now–that would be the kids and their childhood–while you can. But cliches last because of the truth they contain. The kids are gone. And they grew fast. While it was happening it was a grind, specific to my calling. And now the writing gets my full attention. My muse is satisfied on a daily basis. And the kids are only a phone call away. A call I make after the day’s writing is completed of course. Stay true. Thanks, Doug, that’s what I needed to hear. I know I just need to do the best I can while the kids are so tough, and like you say, enjoy them while they’re this age. My daughter has been particularly attached to my wife lately, always wanting her to pick her up, etc. My wife gets frustrated with this sometimes, but we remind ourselves that we’ll miss it when she no longer needs us like that. It’s worth it. As long as I give my writing a little attention every now and then and take some pressure off myself, I can pick up when they’re older. When I’m having that fantasy of not having my 5 and 3 year old girls, all I have to do is imagine life without them and the fantasy quickly disappears. The Sound of Silence: Have We Forgotten How to Be Quiet? Stillness can be the space that allows us to find future answers, but there is a wisdom that sees silence itself as an answer. The intimacy—the purity—of silent togetherness is—I agree with Doty—a basic and original creaturely longing, and one that we find in our relationships with dogs. Reading is an incredible thing, but it’s a poor substitute for life.